PBS; trypsin, 0.2% (w/v) in PBS; collagenase A from Clostridium histolyticum, ... ing 5% FCS; bacterial collagenase 0.4% (w/v) in cell culture medium containing. Nano-Bio Regenerative Medical Institute, College of Medicine, Hallym University, Chuncheon 200-702, Korea; [email protected] (J.M.L. ); [email protected] (M.T.S. ); [email protected] (S.H.K. ); [email protected] (V.K. ); [email protected] (Y.K.Y. ); [email protected] (O.J.L.) Department of Otorhinolaryngology-Head and Neck Surgery, Chuncheon Sacred Heart Hospital, Hallym University College of Medicine, Chuncheon 200-704, Korea Correspondence: [email protected]; Tel. : +82-10-4240-0374 These authors contributed equally to this work. Figure 1 shows the microscopic appearances of the PLA mold, silicone mold, and the PVA/SF ear-shaped hydrogel. The PVA/SF ear-shaped hydrogel shared morphological and physical properties with the natural such asflexibility, structure, elasticity, flexibility,and elasticity, and softness (Figure with the natural human ear,human such asear, structure, softness (Figure 1). In tissue 1). In tissue engineering, shape challenge, is a major particularly challenge, particularly tissues with engineering, controlling controlling the shape isthe a major for tissues for with fragile 3D fragile 3D structures . In this study, we prepared a PLA positive mold using a 3D printer structures . In this study, we prepared a PLA positive mold using a 3D printer following the following theprevious methodsstudies in previous studies to produce a precise 3D ear-shaped hydrogel [2,6,7,10]. A methods in to produce a precise 3D ear-shaped hydrogel [2,6,7,10]. A corresponding corresponding silicone negative mold was to also fabricated construct the desired PVA/SF hydrogel. silicone negative mold was also fabricated construct the to desired PVA/SF hydrogel. PVA/SF-derived PVA/SF-derived ear-shaped hydrogel had a 3D structure similar to that of the positive mold ear-shaped hydrogel had a 3D structure similar to that of the positive mold even after exposingeven it to after exposing it to physical stretching (Figure 1D). physical stretching (Figure 1D). Figure Grossview viewofof polyvinyl alcohol/fibroin silk fibroin (PVA/SF) ear-shaped (A) Figure 1. 1. Gross thethe polyvinyl alcohol/silk (PVA/SF) ear-shaped hydrogel.hydrogel. (A) polylactic polylactic acid (PLA) molds (front and back views); (B) Silicone molds (closed and open views); (C) acid (PLA) molds (front and back views); (B) Silicone molds (closed and open views); (C) PLA/SF PLA/SF ear-shaped hydrogel (front and back views) (D) PLA/SF ear-shaped hydrogel with physical ear-shaped hydrogel (front and back views) (D) PLA/SF ear-shaped hydrogel with physical stretching. stretching. To optimize a suitable PVA/SF composite hydrogel, we fabricated various types of hydrogels To optimize a suitable PVA/SF composite hydrogel, we fabricated various types of hydrogels using different combinations of PVA and SF. The cross-sectional SEM images of the five types of using different combinations of PVA and SF. The cross-sectional SEM images of the five types of hydrogels are shown in Figure 2. Each hydrogel had a different pore size and pore structure. The hydrogels are shown in Figure 2. Each hydrogel had a different pore size and pore structure. The S100 hydrogel contained interconnected irregular pores with a thin wall between pores (Figure 2A), S100 hydrogel contained interconnected irregular pores with a thin wall between pores (Figure 2A), whereas PVA100 contained closed pores with a thick wall between pores (Figure 2B). The P50/S50 whereas PVA100 contained closed pores with a thick wall between pores (Figure 2B). The P50/S50 hydrogel had a uniform appearance and sponge-like structures on the surface unlike the two other hydrogel had a uniform appearance and sponge-like structures on the surface unlike the two other (P25/S75 and P75/S25) composite hydrogels (Figure 2C–E). These observations indicated that the (P25/S75 and P75/S25) composite hydrogels (Figure 2C–E). These observations indicated that the P50/S50 hydrogel was highly interconnected between the pores. P50/S50 hydrogel was highly interconnected between the pores. Figure 2. The The cross-section cross-sectionscanning scanningelectron electron microscope (SEM) images of hydrogels. (A) S100; (B) microscope (SEM) images of hydrogels. (A) S100; (B) P100; P100; (C) P25/S75; (D) P50/S50; (E) P75/S25. Scale = 100 (C) P25/S75; (D) P50/S50; (E) P75/S25. Scale barsbars = 100 µm.μm. Figure 2. The cross-section scanning electron microscope (SEM) images of hydrogels. (A) S100; (B) P100; (C) P25/S75; (D) P50/S50; (E) P75/S25. Scale bars = 100 μm. 2.2.Figure Mechanical Properties, the Swelling Ratio, and Pore Size of 33 represents represents the mechanical properties of the the hydrogels. hydrogels. The Figure mechanical properties The P100 P100 hydrogel hydrogel had had the the highest tensile strength of 0.1765 ± 0.0208 MPa whereas the S100 hydrogel had the lowest tensile highest tensile strength of 0.1765 ± 0.0208 MPa whereas the S100 hydrogel had the lowest tensile Figure 3 represents the mechanical properties of the hydrogels. The P100 hydrogel had the strength, 0.0326 The P50/S50 hydrogel had anan intermediate strength of strength, 0.0326 ±strength ±0.0149 0.0149MPa. MPa. The blended P50/S50 hydrogel had intermediate tensile strength highest tensile of 0.1765 ±blended 0.0208 MPa whereas the S100 hydrogel had thetensile lowest tensile 0.0751 ± 0.0246 MPa. The tensile strength of the SF hydrogels increased gradually as the PVA 0.0326 ± 0.0149 blended P50/S50 hydrogel had an intermediate tensile strength ofstrength, 0.0751 ± 0.0246 MPa. MPa. The The tensile strength of the SF hydrogels increased gradually as theofPVA concentration increased (Figure 3A). 0.0751 ± 0.0246 MPa. The tensile strength of the SF hydrogels increased gradually as the PVA concentration increased (Figure 3A). concentration increased (Figure 3A). Figure3. 3. (A) (A) Tensile Tensile pore size of of thethe hydrogels. Figure strength, (B)swelling swellingratio, ratio,and and(C) (C) pore size Figure 3. (A) Tensile strength, strength,(B) hydrogels. As shown in Figure 3B, the homogeneous hydrogels of SF and PVA had higher swelling ratios in Figure 3B, the homogeneous hydrogels hybrid of SF and PVA had higher swelling ratios than than As theshown composite hydrogels. Among the fabricated hydrogels, the P25/S75 and P75/S25 the composite hydrogels. Among the fabricated hybrid hydrogels, the P25/S75 and P75/S25 hydrogel hydrogel had the lowest and highest swelling ratios, 5.48 ± 0.48 and 1.91 ± 0.58 respectively, whereas hadswelling the lowest andofhighest swelling ratios, was 5.48 intermediate ± 0.48 and 1.91 ± 0.58 respectively, the the ratio the P50/S50 hydrogel at 3.19 ± 0.79. The porewhereas size of the swelling ratio of the P50/S50 hydrogel was intermediate at 3.19 ± 0.79. The pore size of the fabricated fabricated hydrogel is related to the concentration of the PVA in the hydrogels. As the PVA hydrogel is related to the of composite the PVA inhydrogel the hydrogels. the PVA concentration increased, theconcentration pore size of the increasedAs (Figure 3C).concentration increased, the pore size of the composite hydrogel increased (Figure 3C). 2.3. FTIR and TGA 2.3. FTIR and TGA The FTIR peak spectra results for the PVA/SF composite hydrogels are shown in Figure 4A. In The FTIR peak spectra results for the PVA/SF composite hydrogels are shown in Figure 4A. In this this experiment, SF peaks were observed at 1622, 1516, and 1232 cm−1, representing amide І, amide II, experiment, SF peaks were observed at 1622, 1516, and 1232 cm−1 , representing amide I, amide II, and and amide III, respectively. These peaks were also found in the PVA/SF composite hydrogels but amide III, respectively. These peaks were also found in the PVA/SF composite hydrogels but were were absent in the PVA hydrogel. The PVA spectrum contained peaks at 1090 cm−1 (C–O, out-of− 1 absent in the PVA hydrogel. The PVA spectrum contained peaks at 1090 cm (C–O, out-of-plane plane bonding), and 835 cm−1 (C–C bonding), but in the P75/S25 hydrogel, the PVA (C–O bonds) peak bonding), and 835 cm−−11 (C–C bonding), but in the P75/S25 hydrogel, the PVA (C–O bonds) peak was was shifted to 1068−1cm . The peak height and area were directly proportional to PVA/SF ratio. shifted to 1068 cm . The peak height and area were directly proportional to PVA/SF ratio. Figure 4. (A) FTIR spectra; (a) S100; (b) P25/S75; (c) P50/S50; (d) P75/S25; (e) P100; and Figure 4. (A) FTIR spectra; (a) S100; (b) P25/S75; (c) P50/S50; (d) P75/S25; (e) P100; and (B) (B) Thermogravimetric analysis. Thermogravimetric analysis. The thermal thermal stability stability of of the the different different PVA/SF PVA/SF hydrogels hydrogels was was analyzed, analyzed, and and the the results results are are shown shown The ◦ C, whereas in Figure 4B. The hydrogel of 100% SF (S100) exhibited the onset of degradation at 250 in Figure 4B. The hydrogel of 100% SF (S100) exhibited the onset of degradation at 250 °C, whereas ◦ C. The P50/S50 hydrogel the 100% 100% of of PVA PVA (P100) the (P100) hydrogel hydrogel exhibited exhibited early early onset onset degradation degradation at at 200 200 °C. The P50/S50 hydrogel ◦ showed an intermediate onset of degradation at 220 C. These results indicated that thethe addition of SF showed an intermediate onset of degradation at 220 °C. These results indicated that addition of to PVA increased the thermal stability of the blended hydrogel. SF to PVA increased the thermal stability of the blended hydrogel. 2.4. 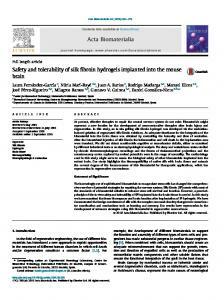 Biocompatibility of the Hydrogels 2.4. Biocompatibility of the Hydrogels To evaluate the biocompatibility of the constructed hydrogels, isolated chondrocytes were culture To evaluate the biocompatibility of the constructed hydrogels, isolated chondrocytes were on each hydrogel, and cell viability was measured using the CCK-8 assay. The graph of the CCK-8 culture on each hydrogel, and cell viability was measured using the CCK-8 assay. The graph of the results presents the absorbance at 450 nm after culturing for one, three and five days. The metabolic CCK-8 results presents the absorbance at 450 nm after culturing for one, three and five days. The activity of chondrocytes on the different types of hydrogels gradually increased from day one to five metabolic activity of chondrocytes on the different types of hydrogels gradually increased from day (Figure 5). one to five (Figure 5). The P50/S50 hydrogel showed significantly more cell growth compared to the P100 and P75/S25 hydrogel after five days of culture. These results indicated that the P50/S50 hydrogel provided a better environment for chondrocyte growth. However, cells on P75/S25 showed the lowest proliferation among the composite groups after five days of culture. Figure 5. CCK-8 assay after culturing rat ear chondrocytes on hydrogels for 1, 3 and 5 days. Significant differences are presented as * p < 0.05, and ns indicates not significant. The P50/S50 hydrogel showed significantly more cell growth compared to the P100 and P75/S25 hydrogel after five days of culture. These results indicated that the P50/S50 hydrogel provided a better environment for chondrocyte growth. However, cells on P75/S25 showed the lowest Figure5.5.CCK-8 CCK-8assay assayafter afterculturing culturingrat ratear earchondrocytes chondrocytes on onhydrogels hydrogels for for 1, 1, 33and and55days. days.Significant Significant Figure proliferation among the composite groups after five days of culture. differences are presented as * p < 0.05, and ns indicates not significant. differences are presented as * p < 0.05, and ns indicates not significant. 2.5. InP50/S50 Vitro Chondrogenesis The hydrogel showed significantly more cell growth compared to the P100 and P75/S25 2.5. In Vitro Chondrogenesis hydrogelMasson’s after five days of culture. results indicated thestaining P50/S50were hydrogel provided a Trichrome (MT) andThese Hematoxylin and eosinthat (H&E) performed after two, Masson’s Trichrome (MT) and Hematoxylin and eosin (H&E) staining were performed after two, better for ofchondrocyte cells hydrogel. on P75/S25 four,environment and five weeks chondrocytesgrowth. culture However, on the P50/S50 Bothshowed MT andthe H&Elowest staining four, and five weeks of chondrocytes culture on the P50/S50 hydrogel. Both MT and H&E staining proliferation among thethe composite groups after days of culture. results showed that lacunar structure andfive neo-cartilage formation appeared in the two-week-old results showed that the lacunar structure and neo-cartilage formation appeared in the two-week-old specimens (Figure 6). The number of lacuna were increased from four weeks to six weeks (Figure 6), specimens (Figure 6). The number of lacuna were increased from four weeks to six weeks (Figure 6), 2.5. 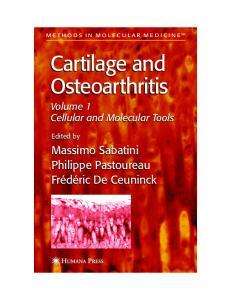 In Vitromeans Chondrogenesis which that cartilage maturity gradually increased over time. A higher amount of residual which means that cartilage maturity gradually increased over time. A higher amount of residual hydrogel components was observed after twoand weeks of (H&E) culture, whereas a fewer amount wastwo, found Masson’s Trichrome (MT) and Hematoxylin eosin staining performed after hydrogel components was observed after two weeks of culture, whereas awere fewer amount was found after six weeks of culture. four, five weeks of chondrocytes culture on the P50/S50 hydrogel. Both MT and H&E staining after and six weeks of culture. results showed that the lacunar structure and neo-cartilage formation appeared in the two-week-old specimens (Figure 6). The number of lacuna were increased from four weeks to six weeks (Figure 6), which means that cartilage maturity gradually increased over time. A higher amount of residual hydrogel components was observed after two weeks of culture, whereas a fewer amount was found after six weeks of culture. Figure 6. Histological examination of vitro in vitro chondrogenesis: 2 weeks, cartilaginous matrix Figure 6. Histological examination of in chondrogenesis: At At 2 weeks, thethe cartilaginous matrix (black stars), immature lacuna (yellow arrows). At 4 weeks, the cartilaginous matrix contained a (black stars), immature lacuna (yellow arrows). At 4 weeks, the cartilaginous matrix containedlarger a number of lacunae (yellow arrows). At 6 weeks, auricular cartilage (triangles) was visible. Scale bars larger number of lacunae (yellow arrows). At 6 weeks, auricular cartilage (triangles) was visible. = 200 μm. Scale bars = 200 µm. Figure 6. Histological examination of in vitro chondrogenesis: At 2 weeks, the cartilaginous matrix (black stars), immature lacuna (yellow arrows). At 4 weeks, the cartilaginous matrix contained a larger number of lacunae (yellow arrows). At 6 weeks, auricular cartilage (triangles) was visible. Scale bars = 200 μm. Int. J.J.Mol. Mol.Sci. Sci.2017, 2017,18, 18,1707 1707 Int. 2.6. In vivo Engineered Cartilage 2.6. In Vivo Engineered Cartilage To reduce the chances of immunogenic rejection, isolated chondrocytes from rats were seeded To reduce the chances of immunogenic rejection, isolated chondrocytes from rats were seeded on the hydrogel and then implanted into the same rat. The ear-shaped engineered cartilages were on the hydrogel and then implanted into the same rat. The ear-shaped engineered cartilages were harvested after six weeks of culture and were found to be phenotypically and mechanically stable harvested after six weeks of culture and were found to be phenotypically and mechanically stable (Figure 7). These results indicated that the PVA/SF composite ear-shaped hydrogel had sufficient (Figure 7). These results indicated that the PVA/SF composite ear-shaped hydrogel had sufficient mechanical strength to maintain its original shape throughout the culture period. We hypothesized mechanical strength to maintain its original shape throughout the culture period. We hypothesized that that there would be no graft rejection or immunogenic reactions with the harvested ear-shaped there would be no graft rejection or immunogenic reactions with the harvested ear-shaped engineered engineered cartilages. The histological findings indicated that there was no inflammatory response, cartilages. The histological findings indicated that there was no inflammatory response, including including neutrophil or lymphocyte aggregation, in the in vivo engineered cartilage samples (Figure neutrophil or lymphocyte aggregation, in the in vivo engineered cartilage samples (Figure 8). This 8). This result indicated that the PVA50/S50 hydrogel did not elicit any immunogenic response during result indicated that the PVA50/S50 hydrogel did not elicit any immunogenic response during the the experimental period. experimental period. Figure 7. Engineered ear-shaped cartilage: Surgical view of 6 weeks after implanting, after harvesting, Figure 7. Engineered ear-shaped cartilage: Surgical view of 6 weeks after implanting, after harvesting, and after subjecting to physical stress. Scale bars = 1 cm. and after subjecting to physical stress. Scale bars = 1 cm. The histological histological evaluation of different parts of The of the the engineered engineeredcartilage cartilagewas wascarried carriedout outononthree three different parts thethe implants, as shown in Figure 8A. MT six weeks after implanting revealedrevealed a much stronger of implants, as shown in Figure 8A.staining MT staining six weeks after implanting a much blue-stained collagen deposition comparedcompared to that in the four-week-old samples. This observation stronger blue-stained collagen deposition to that in the four-week-old samples. This indicated that there was more cartilage formation in the six-week cultured ear-shaped hydrogel. The observation indicated that there was more cartilage formation in the six-week cultured ear-shaped cultured implants consistently showed neo-cartilage formation on theformation PVA/SF ear-shaped hydrogel hydrogel. The cultured implants consistently showed neo-cartilage on the PVA/SF ear(Figure 8B,C). The developed cartilaginous matrix showed a significant number of chondrocytes with shaped hydrogel (Figure 8B,C). The developed cartilaginous matrix showed a significant number of partially mature lacuna at two weekslacuna after implanting. Inafter the 4-week implants, a typical chondrocytes with partially mature at two weeks implanting. In the 4-weekchondrocyte implants, a lacunarchondrocyte structure was formed that was by cytoplasmic the typical lacunar structure was surrounded formed that was surrounded constituents. by cytoplasmicHowever, constituents. development of cartilage, deposition of ECM, and the number of lacuna continuously increased However, the development of cartilage, deposition of ECM, and the number of lacuna continuously during theduring culturethe period. We also observed amounts ECM formation and properand organized increased culture period. We also higher observed higherof amounts of ECM formation proper elastic fibers afterfibers six weeks The cartilaginous matrix at 6matrix weeksatwas completely converted organized elastic after of sixculture. weeks of culture. The cartilaginous 6 weeks was completely into mature auricular with the typical network. Histological analyses of the implants converted into maturecartilage auricular cartilage with lacunar the typical lacunar network. Histological analyses of alsoimplants revealedalso thatrevealed the number chondrocytes per unit area significantly withdecreased the maturation the thatofthe number of chondrocytes per unit areadecreased significantly with of cartilage from to sixfrom weeks. the maturation oftwo cartilage two to six weeks. Figure 8. Histological Histological examination examination of of engineered engineered ear-shaped ear-shaped cartilage: Regions for for the the histological histological Figure 8. cartilage: (A) (A) Regions evaluation of engineered the top, top, middle, middle, and and lower lower regions evaluation of engineered cartilage: cartilage: the regions were were evaluated evaluated for for cartilage cartilage formation. (B) Masson’s Trichrome (MT) staining: (C) Hematoxylin and eosin (H&E) staining. formation. (B) Masson’s Trichrome (MT) staining: (C) Hematoxylin and eosin (H&E) staining. At 2 At 2 weeks, there was a various-shaped immature lacunar structure (black arrows) within weeks, there was a various-shaped immature lacunar structure (black arrows) within the the cartilaginous matrix (stars). At 4 weeks, there was an increase in the number of lacunar structures cartilaginous matrix (stars). At 4 weeks, there was an increase in the number of lacunar structures surrounded by cytoplasmic constituents (yellow arrows) and immature cartilage (triangle). At 6 weeks, surrounded by cytoplasmic constituents (yellow arrows) and immature cartilage (triangle). At 6 mature cartilage (triangle) with a typical chondrocyte lacunar network was visible. Scale bars = 200 µm. weeks, mature cartilage (triangle) with a typical chondrocyte lacunar network was visible. Scale bars = 200 μm. cartilage formation and maturation increased throughout the experimental period (Figures 6 and 8B,C). We also found no significant differences in cartilage formation and maturation level in the different regions of the engineered auricular cartilage at the same time point. These findings collectively indicated that auricular cartilage development and maturation is a time-dependent process. 4. Materials and Methods 4.1. Preparation of SF and PVA Solutions Bombyx mori cocoons were degummed to remove the sericinesby boiling for 1 h in 0.02 M Na2 CO3 solution. The degummed silk was washed in distilled water and then dried in an oven. Subsequently, the degummed silk fibers were dissolved in CaCl2 , ethanol, and distilled water at a molar ratio of 1:2:8, respectively, at 95 mL for 1 h. Then, the prepared solution was filtered through Mira cloth (Calbiochem, San Diego, CA, USA), and ions were removed through dialysis tubing with a molecular weight cut off 12,000 to 14,000 Da (Spectra/Por® , Rancho Dominguez, CA, USA) in distilled water. The final concentration of the SF in the solution was 6 wt %, which was confirmed by weighing the residual solid after drying. This solution was concentrated up to 10% w/v using poly (ethylene glycol) (PEG) and stored at 4 ◦ C. PVA 10% w/v solution was prepared by dissolving PVA (Mw 9000–10,000, 80% hydrolyzed, Sigma Aldrich, St. Louis, MO, USA) in distilled water in a flask with continuous stirring at 80 ◦ C for 2 h. Subsequently, it was cooled to room temperature for further uses. 4.2. Preparation of the 3D Ear Mold The 3D ear mold was prepared with a Fuse Deposition Modeling (FDM) 3D printer (3DISON, Seoul, Korea) using PLA filaments. The human ear 3D modeling file was converted to a slicing program for 3D printing. A 3D ear negative mold was also prepared using silicone (GT Products, Inc., 501 Industrial Blvd, Grapevine, TX, USA). 4.3. Fabrication of Hydrogel We constructed five types of hydrogel with different ratios of PVA and SF: 100% PVA (P100), 75% PVA and 25% SF (P75/S25), 50% PVA and 50% SF (P50/S50), 25% PVA and 75% SF (P25/S75), and 100% SF (S100). The fabrication was performed by the salt leaching method . The ear-shaped hydrogel was fabricated by filling the negative mold with only the P50/S50 blend and salt particles (Figure 9). Finally, the fabrication of the hydrogels and ear-sheped hydrogel was completed by subjecting them to freeze-thaw cycles (12/12 h) for 3 days. The freeze-thaw cycles induce physical cross-linking within the polymers . Thereafter both the hydrogel and ear-shaped hydrogel were transferred to distilled water to remove the salt for three days. 4.4. Analysis of Mechanical Properties (Tensile Strenth) The tensile strenth of hydrogels was analyzed using a QM 100S (Qmesys Corp., Kyounggi, Korea) equipped with the across-head speed of 1 mm/min. The samples were punched from a parallel portion of 20 mm in length and 2.5 mm in width. At least three specimens were tested from each group, and the average values were calculated. 4.5. Swelling Ratio and TGA Analysis The swelling ratio was calculated according to an previously reported method . Each hydrogel was immersed in distilled water at room temperature for 24 h. After that, the excess water was removed, and the wet weight (Ws) of each hydrogel was measured. The hydrogels were then dried in an oven at 60 ◦ C under vacuum overnight, and the dry weight (Wd) of the hydrogel were measured. Finally, the swelling ratio of each hydrogel was calculated using following formula. 11 of 15 (Ws − Wd) (1) Wd The TGA of the hydrogels were analyzed (TA Instruments, Newcastle, DE, USA) by ramping The TGA of the hydrogels were analyzed (TA Instruments, Newcastle, DE, USA) by ramping the the samples at 10 °C/min, and heating was started from 30 to 700 °C. Heating was followed under a samples at 10 ◦ C/min, and heating was started from 30 to 700 ◦ C. Heating was followed under continuous nitrogen purge of 100 mL/min, and spectra were collected using Q600 Software (TA a continuous nitrogen purge of 100 mL/min, and spectra were collected using Q600 Software Instruments). (TA Instruments). Figure 9. Schematic representation representation of of the the process process for for ear-shaped ear-shaped hydrogel hydrogel fabrication. fabrication. PVA PVA and and SF SF Figure 9. Schematic solutions were prepared by dissolving them in distilled water. The PVA/SF composite was prepared. solutions were prepared by dissolving them in distilled water. The PVA/SF composite was prepared. The ear-shaped ear-shaped hydrogel hydrogel was was fabricated fabricated using using the the salt salt leaching leaching method method by by filling filling aa silicone silicone mold. mold. The Fabrication was byby subjecting them to freeze-thaw cycles,cycles, and finally, the salt was Fabrication wascarried carriedout out subjecting them to freeze-thaw and finally, the removed salt was by placing them in distilled water. removed by placing them in distilled water. 4.6. SEM SEM and and FTIR FTIR Analysis Analysis 4.6.
μm pore size, SPL Life Sciences, Pocheon-si, Korea) and centrifuged for 5 min at 1000 rpm. Finally, the pellet was suspended and cultured in DMEM supplemented with 10% FBS (fetal bovine serum) and 1% A/A (antibiotics/antimycotics). pore size, SPL Life Sciences, Pocheon-si, Korea) and centrifuged for 5 min at 1000 rpm. Finally, the pellet was suspended and cultured in DMEM supplemented with 10% FBS (fetal bovine serum) and 1% A/A (antibiotics/antimycotics). 4.8. Cell Seeded Hydrogels Each hydrogel (6 mm size) was sterilized in 70% ethanol. Then, the hydrogels were seeded with 2 × 104 chondrocytes per hydrogel with 50 µL medium in 96-well culture plates. Subsequently, after an hour for attachment, 150 µL fresh medium was added to each well followed by incubation at 37 ◦ C with 5% CO2 . The cytotoxicity of the hydrogel was measured using a CCK-8 assay kit (Enzo Life Sciences, Farmingdale, NY, USA) after one, three, and five days of culture. Absorbance was measured at 450 nm by a microplate reader (Molecular Devices, Sunnyvale, CA, USA). For in vitro chondrogenesis, cell-seeded P50/S50 hydrogels were cultured for 2, 4, and 6 weeks. Then, the harvested hydrogels were fixed in 4% paraformaldehyde. The hydrogels were embedded with Optimum Cutting Temperature (OCT) (Leica Biosystems Melbourne Pty Ltd., Melbourne, Australia) compound and frozen at −80 ◦ C. The specimens were sectioned at a 5-µm thickness and stained with Hematoxylin and eosin (H&E) and Masson’s Trichrome (MT). 4.9. Animal Study Animal studies were carried out following the guidelines and with the approval of the Institutional Animal Care and Use Committee of Hallym University. The adult male Sprague-Dawley rats weighing 250–270 g each was housed in separate plastic cages with free access to laboratory rodent food and water under appropriate air and light conditions. The ear-shaped hydrogels were seeded with 2 mL of cell suspension at a density of 1 × 107 cells/mL and were incubated for one day. Then, the hydrogels were implanted subcutaneously into rats. After 2, 4, and 6 weeks, the ratswere sacrificed, and implants were harvested. The harvested ear-shaped hydrogels were fixed in 4% paraformaldehyde. The hydrogels were divided into three pieces (Figure 8A) and embedded in optimum cutting temperature (OCT) compound followed by freezing at −80 ◦ C. The specimens were sectioned at a 5-µm thickness and were stained with H&E and MT. 4.10. Statistical Analysis Data are shown as the mean ± SEM from at least three independent experiments and were analyzed using GraphPad Prism (GraphPad software, San Diego, CA, USA) followed by one-way analysis of variance with Dunnett’s post-hoc test. Significant differences are presented as * p < 0.05, and ns indicates not significant. 5. Conclusions This study demonstrates a precise method for engineering an ear-shaped cartilage using a PVA/SF hydrogel. The P50/S50 hydrogel showed reasonable porosity and water-binding abilities to provide a suitable environment for chondrocyte growth and the regeneration of auricular cartilage both in vitro and in vivo. This hydrogel also offered sufficient mechanical strength during the entire period of its engineering and did not induce graft rejection or immunogenic reactions. Histological observations revealed that mature cartilage with a typical lacunar structure formed within six weeks of culture implants. In future studies, we will investigate the deposition rate of different glycoproteins in neocartilage at various times and maturity levels. Thus, the process developed in this study could be a promising method for auricular cartilage engineering and external ear reconstruction. Acknowledgments: This work was supported by the Hallym University Research Fund and Cooperative Research Program for Agriculture Science & Technology Development (Project No.PJ011214), Rural Development Administration, Republic of Korea. Author Contributions: Chan Hum Park designed and supervised research. Jung Min Lee and Md. Tipu Sultan performed the experiments. Soon Hee Kim, Vijay Kumar, Yeung Kyu Yeon, and Ok Joo Lee contributed to the data analysis and scientific discussion. Md. Tipu Sultan and Chan Hum Park wrote the manuscript. Jung Min Lee and Md. Tipu Sultan equally contributed to this work. All authors read and approved the final manuscript. Conflicts of Interest: The authors declare no conflict of interest. 45. 46. 47. 48. 49. 50. Grant, C.; Twigg, P.; Egan, A.; Moody, A.; Smith, A.; Eagland, D.; Crowther, N.; Britland, S. Poly(vinyl alcohol) hydrogel as a biocompatible viscoelastic mimetic for articular cartilage. Biotechnol. Prog. 2006, 22, 1400–1406. [CrossRef] [PubMed] Spiller, K.L. ; Laurencin, S.J. ; Charlton, D.; Maher, S.A.; Lowman, A.M. Superporous hydrogels for cartilage repair: Evaluation of the morphological and mechanical properties. Acta Biomater. 2008, 4, 17–25. [CrossRef] [PubMed] Kobayashi, M.; Chang, Y.S. ; Oka, M. A two year in vivo study of polyvinyl alcohol-hydrogel (PVA-H) artificial meniscus. Biomaterials 2005, 26, 3243–3248. [CrossRef] [PubMed] Shieh, S.J. ; Terada, S.; Vacanti, J.P. Tissue engineering auricular reconstruction: In vitro and in vivo studies. Biomaterials 2004, 25, 1545–1557. [CrossRef] Balakrishnan, B.; Banerjee, R. Biopolymer-based hydrogels for cartilage tissue engineering. Chem. Rev. 2011, 111, 4453–4474. [CrossRef] [PubMed] Dehghani, F.; Annabi, N. Engineering porous scaffolds using gas-based techniques. Curr. Opin. Biotechnol. 2011, 22, 661–666. [CrossRef] [PubMed] Berry, C.C. ; Campbell, G.; Spadiccino, A.; Robertson, M.; Curtis, A.S. The influence of microscale topography on fibroblast attachment and motility. Biomaterials 2004, 25, 5781–5788. [CrossRef] [PubMed] Yannas, I.V. ; Lee, E.; Orgill, D.P. ; Skrabut, E.M.; Murphy, G.F. Synthesis and characterization of a model extracellular matrix that induces partial regeneration of adult mammalian skin. Proc. Natl. Acad. Sci. USA 1989, 86, 933–937. [CrossRef] [PubMed] Annabi, N.; Mithieux, S.M. ; Boughton, E.A. ; Ruys, A.J. ; Weiss, A.S.; Dehghani, F. Synthesis of highly porous crosslinked elastin hydrogels and their interaction with fibroblasts in vitro. Biomaterials 2009, 30, 4550–4557. 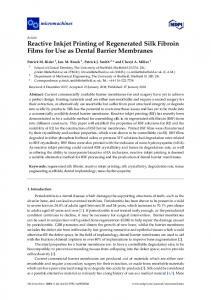 [CrossRef] [PubMed] Whittaker, J.L. ; Dutta, N.K. ; Elvin, C.M. ; Choudhury, N.R. Fabrication of highly elastic resilin/silk fibroin based hydrogel by rapid photo-crosslinking reaction. J. Mater. Chem. B 2015, 3, 6576–6579. [CrossRef] Ji, C.; Annabi, N.; Khademhosseini, A.; Dehghani, F. Fabrication of porous chitosan scaffolds for soft tissue engineering using dense gas CO2. Acta Biomater. 2011, 7, 1653–1664. [CrossRef] [PubMed] Bryant, S.J. ; Anseth, K.S. Hydrogel properties influence ECM production by chondrocytes photoencapsulated in poly(ethylene glycol) hydrogels. J. Biomed. Mater. Res. 2002, 59, 63–72. [CrossRef] [PubMed] Park, H.J. ; Lee, O.J. ; Lee, M.C. ; Moon, B.M. ; Ju, H.W. ; Lee, J.; Kim, J.H. ; Kim, D.W.; Park, C.H. Fabrication of 3D porous silk scaffolds by particulate (salt/sucrose) leaching for bone tissue reconstruction. Int. J. Biol. Macromol. 2015, 78, 215–223. [CrossRef] [PubMed] Neo, P.Y. ; Shi, P.; Goh, J.C.; Toh, S.L. Characterization and mechanical performance study of silk/PVA cryogels: Towards nucleus pulposus tissue engineering. Biomed. Mater. 2014, 9, 065002. [CrossRef] [PubMed] Tangerino Filho, E.P. ; Fachi, J.L. ; Vasconcelos, I.C. ; Dos Santos, G.M. ; Mendonca, F.A. ; de Aro, A.A.; Pimentel, E.R. ; Esquisatto, M.A. Effects of microcurrent therapy on excisional elastic cartilage defects in young rats. Tissue Cell 2016, 48, 224–234. [CrossRef] [PubMed] Ito, I.; Imada, M.; Ikeda, M.; Sueno, K.; Arikuni, T.; Kida, A. A morphological study of age changes in adult human auricular cartilage with special emphasis on elastic fibers. Laryngoscope 2001, 111, 881–886. [CrossRef] [PubMed] Cancedda, R.; Dozin, B.; Giannoni, P.; Quarto, R. Tissue engineering and cell therapy of cartilage and bone. Matrix. Biol. 2003, 22, 81–91. [CrossRef] Sasaki, S.; Murakami, T.; Suzuki, A. Frictional properties of physically cross-linked PVA hydrogels as artificial cartilage. Biosurface Biotribol. 2016, 2, 11–17. [CrossRef] © 2017 by the authors. Licensee MDPI, Basel, Switzerland. This article is an open access article distributed under the terms and conditions of the Creative Commons Attribution (CC BY) license (http://creativecommons.org/licenses/by/4.0/). Report "Artificial Auricular Cartilage Using Silk Fibroin and ... - Semantic Scholar"